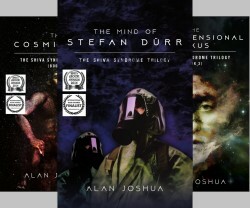 The Mind of Stefan Dürr is a Sci-Fi Thriller and its the first book of the SHIVA Syndrome trilogy. An experiment studying the human’s mind goes wrong and suddenly strange things begin to happen in Canada, USA, and Russia. Dr. Beau Walker is recruited to search on whats going on and that’s when the adventure begins. In a world where there are unimaginable high advanced technologies waiting to be explored, Dr. Walker has to find the cause or else there won’t be much to live for. The storyline has a mixture of science fiction and spirituality. This multidimensional story is far from over as you begin understanding the concept of its strong world setting. The author leaves nothing to question or doubt supplying a very in-depth and thoughtful plot. The entire story is thrilling to read and satisfying to a person who really appreciates good literature and Sci-fi stories. I recommend this book to people that like to read stories where the human mind creates realistic outcomes in the world. The progression in The Shiva Syndrome Trilogy is a sort of an evolution in human consciousness toward a greater awareness, a spiritual realization. Therefore, the spiritual mystery is itself an evolutionary process. . . I do think he has created an authentic genre. Alan Joshua’s spiritual mystery venture is for me an exciting romp of a read. I was frequently left thinking about one thing or another after I would put down the manuscript. I hope to see it in print, buy, and share it with my friends and colleagues.